Celebrate the 10K Diamond Anniversary! Whether you call it putt-putt, mini-golf, or adventure golf, this sport is having a celebration. We hope you will join us in celebrating a very special anniversary! It is the 100th anniversary of mini-golf! At The Family Fun Center in Lakeland Florida we have a recently renovated mini-golf course perfect for you and your family to celebrate! 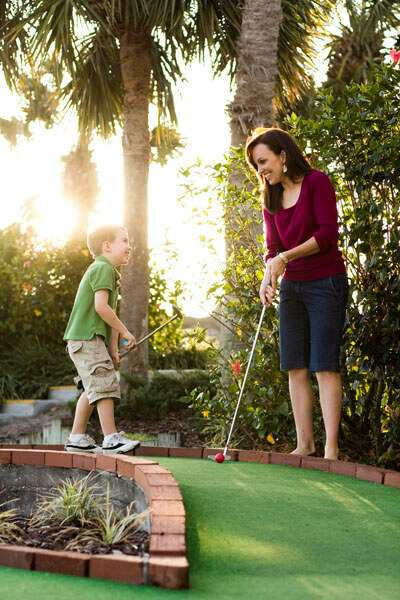 Our 18-hole mini-golf can challenge even the most experienced golfer and can bring you closer with your family. Let’s learn a bit more about the history of this sport! Mini-golf has been around since the the 19th century and was originally developed as an answer to women wanting to play a “man’s sport”, since etiquette deemed it improper for a woman to “take the club past her shoulders.” The first mini-golf course opened in Pinehurst, NC, in 1916, and was called Thisle Dhu. By 1926, designers were starting to create “mini-golf courses” on the rooftops of buildings in New York, and it soon became a very popular sport. After the start of the Great Depression however, frivolity became something people could not afford so cheaper courses started to spring up. Because these courses could not afford fancy obstacles, so they used whatever they had i.e. old tires, rain gutters, etc. until it eventually became so popular it was the norm. In 1953, Mr. Don Clayton was fed up with the silly style that had become the norm, and he became an advocate for mini-golf as a serious sport. This is the form we modeled our Adventure Golf after, with undulating terrain, beautiful landscaping, and a natural pond complete with waterfall. Bring the family, and have a great time celebrating the 10K anniversary of Mini-Golf!